Once upon a time there was a rich merchant. 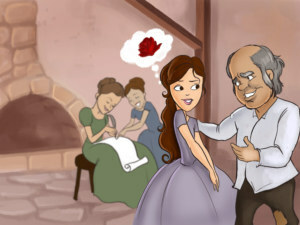 He had three beautiful daughters, but the youngest was the most beautiful. When she was a child everyone called her Beauty and the name stuck with her over the years. 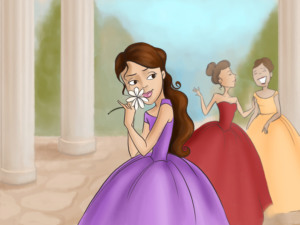 Her sisters envied her because she was also the kindest and the smartest of the three. Their father lost all his money because his ships sank at sea. The family had to move to a small cottage in a small village. The man went to the fields every morning to work, while Beauty did the cleaning and prepared lunch for her family every day. The only thing her sisters did was wake up late, wander around all day and complain that they had no lovely clothes to wear anymore. A year passed. 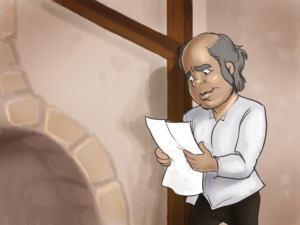 One day the father received a letter saying that one of the ships he owned had returned undamaged. It meant that the family was rich again. When the man arrived at the ship, it was undamaged, but it was empty and so the man had to go back home as poor as he was before. There were only ten miles left to his house when suddenly a blizzard started. 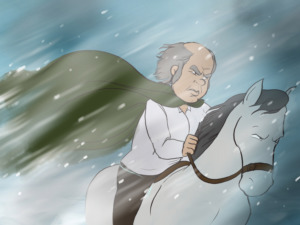 The snow was so thick and the winds so strong that the man fell off his horse twice. It was evening and the man thought that he was going to die from cold and hunger. Just then he spotted a castle not far away. 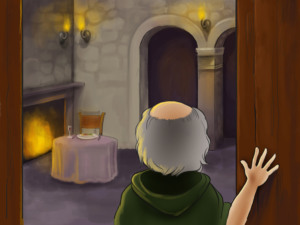 He arrived at the castle and went into a hall. There was a fire where he could dry his clothes and a table set for just one person. The man waited to see if anyone would come, but since no one came, and he couldn’t stand the hunger any longer, he ate the meal in front of him. He felt a lot better and started to explore the castle. At last he found a bed, which seemed to have been made up for him. He didn’t bother waiting, but got in and fell asleep right away. 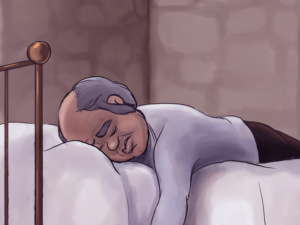 When he woke up the next day, he was surprised to find some clean clothes left out for him instead of his own dirty clothes. He put them on and went outside to find his horse. 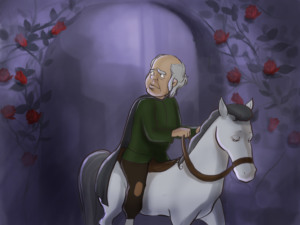 On his way out of the castle he passed under an arch of roses and remembered what his youngest daughter had asked him to bring her. He plucked some roses from the bush. 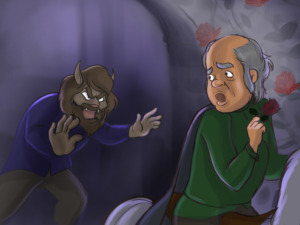 At once, he heard a terrible roar and saw a beast running towards him. “You are so ungrateful! I gave you food, a warm bed, and clothes and still you pick my roses, the only thing I truly love. Prepare to die!" "Please master, don’t kill me," the man answered, “I have three lovely girls waiting for me to get back home." "I'm not your master, I'm a beast, so don’t flatter me. But you said you have daughters. You can go, but you must promise that one of your daughters will come on her own and die instead of you. If not - you should come back in three months to die." The man had no choice but to agree. The beast had one last thing to say. 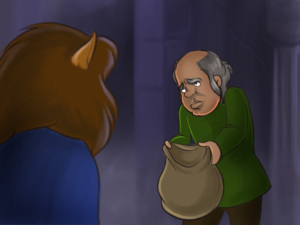 "I don't want you to leave the castle with empty hands. Before you leave take this bag and fill it with as much gold and precious things as you can find." The man went home. He was very sad. 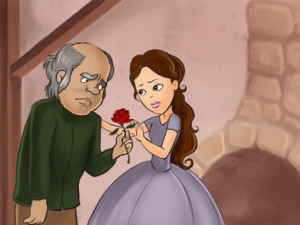 He gave Beauty the roses he had taken from the beast's garden and told everyone what had happened. 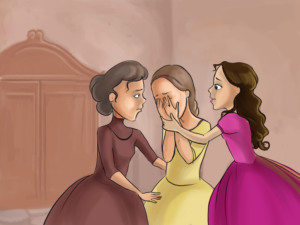 The older sisters started crying but Beauty stayed calm. Nothing could make Beauty change her mind. 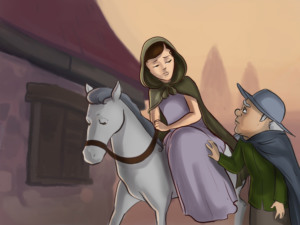 The next day she left with her father to go to the beast's castle. 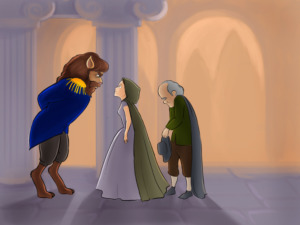 On the way, her father told Beauty about the gold which the beast had made him take. She advised her father to use the money as a dowry for her sisters. When they arrived at the palace the beast met them. "Did you come here of your own will?" he asked. "Yes,” Beauty replied. 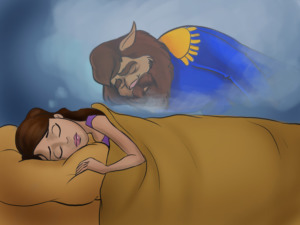 "Your heart is too good!” the beast exclaimed and told them to have dinner and sleep well. 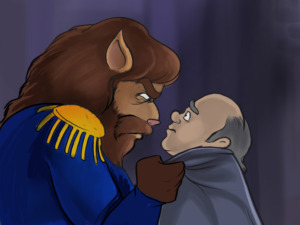 “Tomorrow morning you can leave the palace”, the beast told the man. 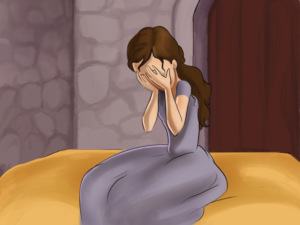 The next morning, after her father left the palace, Beauty started crying. 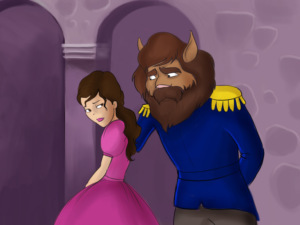 She thought that the beast wanted to kill her. 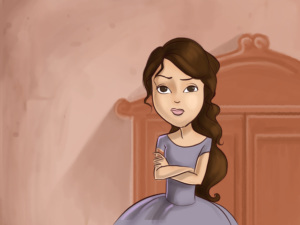 With her head full of these horrible thoughts, the girl started walking around the palace. It was very beautiful. Beauty couldn’t lie, so she answered, “Yes, indeed I do, but I believe you have a good heart”. “You are right. Not only am I disgusting, but I don’t have any brains either. I am a beast”, he said and left her to have her dinner alone. 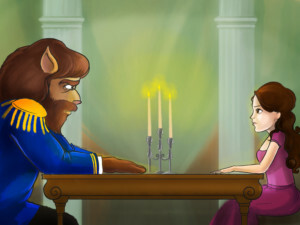 The next evening the Beast entered the room around dinner time and asked the Beauty a question which shocked her. “Will you marry me?” he asked. “No, beast”, she answered. 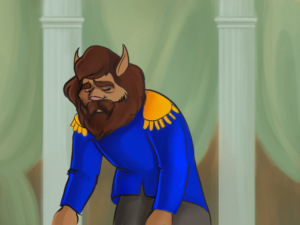 He sighed and left the room again. 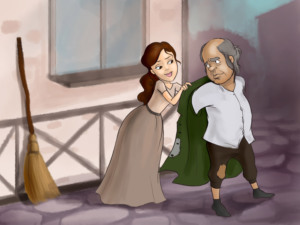 This is how they lived for three months - Beauty’s happiness would have been complete if the beast didn’t ask her one and the same question every evening. 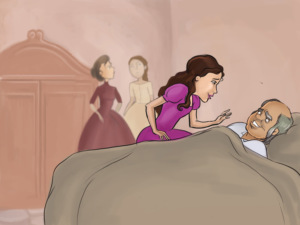 The next morning she woke up at her father’s home. When he saw his youngest daughter at home safe and well, the father got very excited. Her sisters also came to see her. They were both very envious and angry that Beauty was all dressed up in a lovely dress and was looking more beautiful than ever. 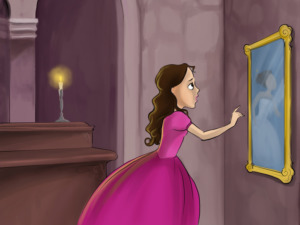 They came up with a sly plan to make Beauty go back to the castle later than she had promised so that the beast would get angry and kill her. When the eighth day came, they started crying and asking their youngest sister to stay with them a little more. Beauty’s good heart didn’t even think there could be a plan and she believed they truly missed her. She promised to stay eight more days. But on the tenth day, Beauty had a dream. In her dream the Beast was lying in the garden almost dead. She woke up and put her ring on the table. The next morning she woke up in the castle. She called for the beast but no one replied. She searched for her Beast everywhere but she couldn’t find him. At last she remembered her dream and went in the garden. There she found the beast. He had fainted, but Beauty thought he was dead. “He died, because of me!” she thought and a tear drop fell on his chest. 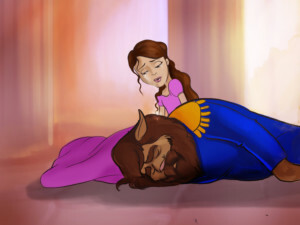 As soon as Beauty’s tears dripped onto his chest, Beast turned into a handsome prince. Beauty was amazed. 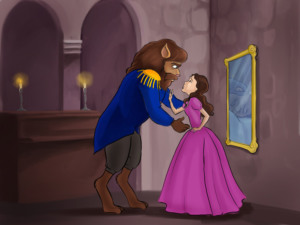 “I was turned into a hideous beast by a fairy long ago, because I didn’t let her shelter in the castle when there was a storm,” Beast explained, “only finding true love could break the spell. 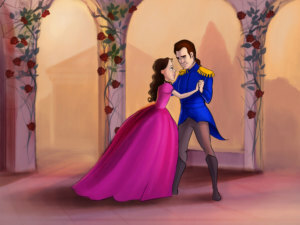 Will you marry me?” Beauty agreed happily and they lived many long years together in the castle.